A centuries-old battle between ninja and samurai over a stolen sword... enter 'Rage Cage' Reeves Taught to fight by his war hero grandfather, Reeves comes home to find Grandpa Butch embroiled in a centuries-old battle over a treasured Japanese sword. Together they team up with Tara the hot-rodding ambulance driver and a secretive member of a samurai warrior brotherhood to take on a powerful clan of ninja and yakuza bent on sparking a third world war. 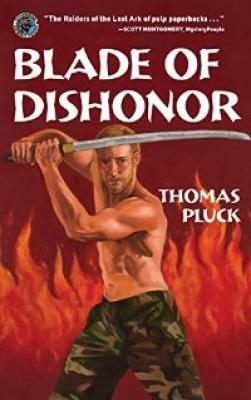 From the heroics of the Devil's Brigade in World War II and the brutal underground fight scene of Tokyo to the American heartland, BLADE OF DISHONOR pits battle-hardened cage fighters against cunning shadow warriors in a thrilling adventure story that's part Kurosawa and part Tarantino ... with a ton of Pluck.